Cutting edge length: 3.75 in. 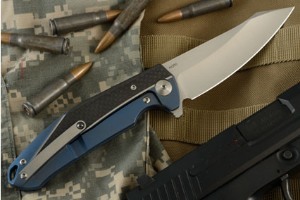 Description: The K-1 Flipper from Reate Knives is a spectacular every day carry folder. From its sleek, yet ergonomic lines, to its beautifully shaped harpoon style blade, Reate continues to show they can build a premium folder at great price. 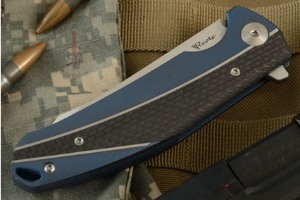 Reate Knives designs and builds its high quality knives with immaculate fit and finish. The founder of Reate, David Deng, is a long time knife enthusiast with a background in mechanical design and manufacturing. Reate uses only the best blade steels, gathered from around the world and never compromises on materials. Reate is changing the way the industry looks at knives made in China. This K-1 Flipper features a blade made from satin finished M390 stainless steel, a super-steel created by Bohler in Austria. It takes an incredibly sharp edge and holds on to it due to its high concentration of vanadium and chromium carbides. Its unique powder metallurgical process also promotes a uniform carbide distribution and clean steel properties, making M390 a popular steel used in surgical cutting instruments and in applications requiring a high finish. It offers excellent corrosion resistance due to its high concentration of chromium. The blade can be easily deployed using the ambidextrous flipper and it has smooth action thanks to the bearing system pivot. The spine of the blade has been rounded to be comfortable when pressing down on the blade. 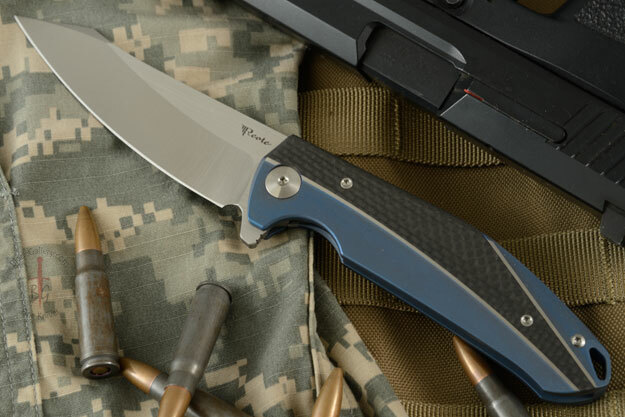 The machined titanium handle has a sturdy frame lock and a tumbled blue anodized finish. 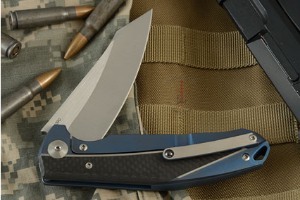 Carbon fiber is flawlessly inlaid into both sides of the titanium scales. 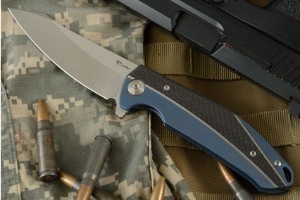 The flats of the titanium are satin finished to highlight the carbon fiber and exhibit Reate's exceptional precision. The inside of the scales are skeletonized to reduce overall weight. The titanium backspacer is nicely rounded to complete the handle. A lanyard can be added if some extra grip is needed. 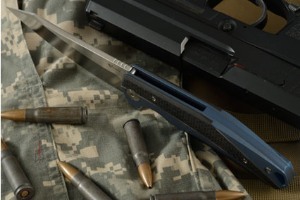 The titanium pocket clip with ceramic ball is mounted for right-handed, tip-up carry. This knife comes with a zipper storage pouch, a small pocket pouch, a Reate patch, and a cleaning cloth. 0.140625 0.0302734375 140.625 30.2734375 Trailer Started. 0.2353515625 0.0947265625 235.3515625 94.7265625 Trailer Completed.